Hope's Cafe: Pureology Hair care-Review and Giveaway!! Well, I have found a new favorite hair care company. I recently was given the chance to try some products from Pureology, and I am overwhelmed at how nice they make my hair feel! I was sent the SuperSmooth Shampoo and Conditioner, which is designed to increase shine and manageability, with natural ingredients. I mentioned before that I almost always have to use conditioner every day, otherwise my hair is frizzy and won't cooperate with styling. As an experiment, I used just the SuperSmooth Shampoo for several days in a row-no conditioner, no add-ins for hydration or frizz-control. And guess what? I couldn't even tell! My hair was as smooth and silky as if I had been loading it with extra-moisture products! This shampoo and conditioner are made with camellia and sesame oils and shea butter, to deliver powerful cleansing, moisturizing and conditioning. Another huge plus with these products is that (at least for me) it lasts longer than other shampoos I have tried. Because I have long hair, I usually have to use at least a quarter-size amount to fully cleanse and condition. I have noticed with the Pureology products though, I can literally use a dime-size squirt, and it builds a nice, rich lather! The same with the conditioner-a dime-size amount is more than enough! I absolutely love Pureology shampoo and conditioner! I will definitely be purchasing more when I run out. I will also be checking out their other styling products! 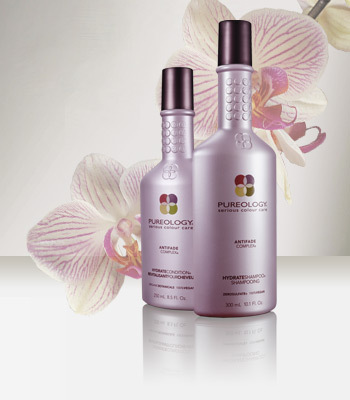 (To see where you can find Pureology products near you, check out their Salon Locator page). "Pureology was created in Irvine, California in 2001. It was here that salon industry pioneer Jim Markham revolutionized colour care and launched the first 100% vegan formulas andZeroSulfate® shampoos for colour-treated hair. Jim identified a need among professional colourists and their clients for gentle, naturally-based products that deliver superior performance forLonger Lasting Hair Colour Guaranteed!® Today, Pureology is the #1 colour care brand in the USA and our high-performance products are an industry standard." Pureology is giving a Hair Care set to one of my readers!! This set will include the Hydrate Shampoo and Conditioner, SuperSmooth SmoothingElixir, SmoothingCream, RelaxingSerum and RelaxingHairMasque!! 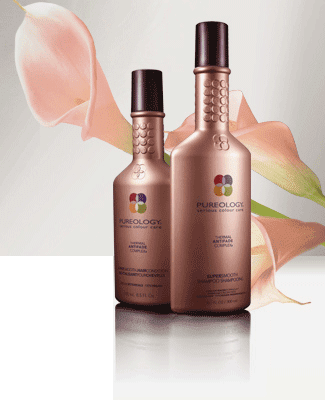 Visit Pureology and tell me which Pureology System would best fit your hair care needs! This giveaway ends Thursday, October 21, 2010 at 11:59 p.m. Please leave a valid email address in each comment, as this is how the winner will be notified. Winner will have 48 hours to respond, or another winner will be chosen. Giveaway open to US residents only. Disclaimer:I was not monetarily compensated in any way for this review. I did receive product for the purpose of review. All thoughts and opinions are mine. All quotes taken from the Pureology website. I would love to try the Super Smooth!! Please enter me. Thanks! I also entered your Steel Orchids giveaway. Entered your Sassy Scrubs giveaway. Entered your Cuppa Jane giveaway as well. And I entered your Hair Zing giveaway. Also entered the MyTwinn giveaway. I think the Hydrate system would be great for my hair! I entered your You've Been Sentenced giveaway! I'd like to try the pure volume system. I entered your Hairzing giveaway! The Hydrate System would work best for me.